When the word on the streets came out that the Hexbug original was in stock and shipping the crowds went wild. Each one of these is its own unique bug and will bring years of delight to kids and adults. Reach in and grab an original hexbug. Comes in 5 stunning colors. 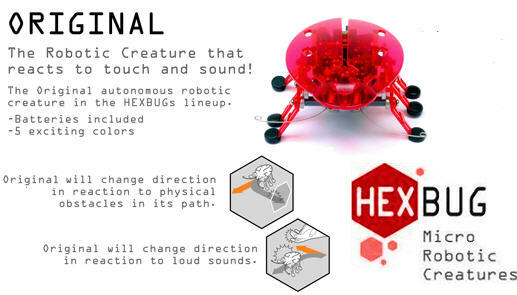 The original Hexbugs react to sound and touch. Alpha, number one, the leader of all hexbugs is here along with the rest of his troop ready to make some racket. Don't let the orange color fool you he is a force to fear. The Hexibug that is Green with Envy and Bravo is the number 2 Robot. Sleek like a stealth bobble this robotic bug is amazing. The black color of the delta hexbug makes him blend into his surroundings.